What Are The 2019 Lyft Driver Requirements? The rideshare industry has exploded in popularity over the past few years. As the demand for rides goes up, so does the need for rideshare drivers. As one of the industry’s top competitors, Lyft is currently expanding its fleet and operation areas, which is creating ample opportunity for people to launch a new career as one of their drivers. If you’re interested in driving for Lyft, take a deep dive into the Lyft driver requirements below. Lyft drivers operate as independent contractors, so you’ll choose your own schedule. Drivers are also largely in control of their earning potential. This arrangement means you can work full or part-time and set your own income goals, making it incredibly appealing to individuals from all walks of life. Yet, before you can become a driver, you need to make sure that you meet their qualifications. Here’s a closer look at each of the requirements to help you pinpoint exactly what the company is looking for. To join the Lyft fleet, you need to be at least 21 years old. Unfortunately, if you don’t meet the age requirement, it automatically eliminates you from the hiring process. Since the company utilizes your social security number when processing your application, there’s no way around this requirement. However, if you’re under 21, you can still sign up as a delivery driver for places like Doordash or Caviar. All Lyft drivers must have a current driver’s license. To ensure their drivers are adequately experienced, Lyft requires each applicant to be licensed for at least a year before they apply. If you passed your test recently or just had your license reinstated, then you’ll have to wait until you’ve hit the 12-month mark to apply. Lyft drivers and their vehicles must be fully insured based on their state’s laws. If you plan to drive someone else’s car, you have to be listed on their insurance policy to meet the Lyft requirements. The company doesn’t require their drivers to take out additional coverage, but drivers can purchase additional rideshare insurance to ensure they’re properly protected on the road. The Lyft driver requirements are fairly strict regarding applicant driving histories. You can’t have more than three minor violations on your record, like speeding tickets, or a single major issue, like a suspension, within the last three years. All driving charges related to being under the influence of alcohol or drugs have to be more than seven years old or you’re disqualified. The company completes a DMV check to evaluate each candidate’s driving history in full. Lyft also completes a background check on their drivers to ensure the safety of their passengers. Any violent or sexual crimes on your record will flag your application and prevent you from moving further in the process. Individuals with felonies or drug-related charges are also eliminated from the driver pool. Additionally, applicants with a history of burglary, theft, or causing property damage aren’t eligible to work with Lyft. There are also other Lyft requirements that you should consider, with the most notable being the Lyft car requirements. There are base vehicle standards which will qualify you for their economy ride options. If your vehicle meets the requirements for their higher-end ride styles, you can make more money per trip. It’s also important to remember that a driver position is a customer-facing role. While it’s not technically a Lyft requirement to be a people-person, the ability to practice great customer service can affect your pay. Passengers often tip drivers who made their journey enjoyable, so being able to read people and their demeanor to determine the best way to interact with them is a valuable trait in the industry. If you don’t meet the Lyft driver requirements, it doesn’t mean you’re out of money-making options. Age is the biggest factor for many prospective rideshare drivers, but there are other options with lower requirements. In addition to the delivery services mentioned above, Postmates and Instacart also have a minimum driver age of 18. They’re also less restrictive regarding the vehicle you utilize because you aren’t hauling passengers around. You can also boost your income by charging electric scooters for companies like Bird and Lime, both of which have fewer requirements to sign up than Lyft or Uber. To become a Bird charger or LimeBike juicer, you only need to be 18 years old, own a vehicle, and live close to one or more of their service areas. While you may not be able to make a full-time living charging scooters, this option is good for anyone looking for a side hustle. The potential payoff is much higher than the actual work involved. If you meet the Lyft requirements, then you’re one step closer to starting your new career. Follow our handy guide—How to Become a Lyft Driver—to set yourself up for success! We also offer a huge range of other articles to help you successfully navigate the rideshare and bikeshare industries. 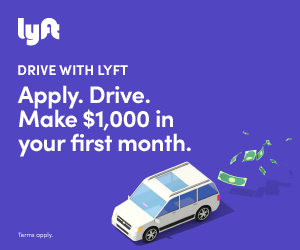 If you’d like to amplify your potential earnings even further, sign up to become a driver using our Lyft driver promo code. It can help you earn up to $2500 in bonuses, depending on your location.